A senior business journalist whom I know – a veteran of reporting and editing stories about some of the biggest corporate scandals of the last few decades – has a simple theory of how business people and companies often get themselves into trouble with the law. That’s not to say that outright liars and thieves don’t exist in the business world. Bernard Madoff’s multi-billion dollar Ponzi scheme – in which he stole even from friends and charitable organizations – is an example of sociopathic criminality at a high level. But more often than not, the battle over ethics and values is fought on a daily basis, by average people, in face-to-face confrontations involving routine business issues. And when things go wrong in that day-to-day world – as they have recently, at firms like BP and Goldman Sachs – an implied assumption is that individuals have lost their sense of right and wrong, driven by expedience or greed. The theory is that no one speaks up because their moral compass has gone haywire. Babson College business professor and consultant Mary C. Gentile thinks it’s a lot more complicated than that. 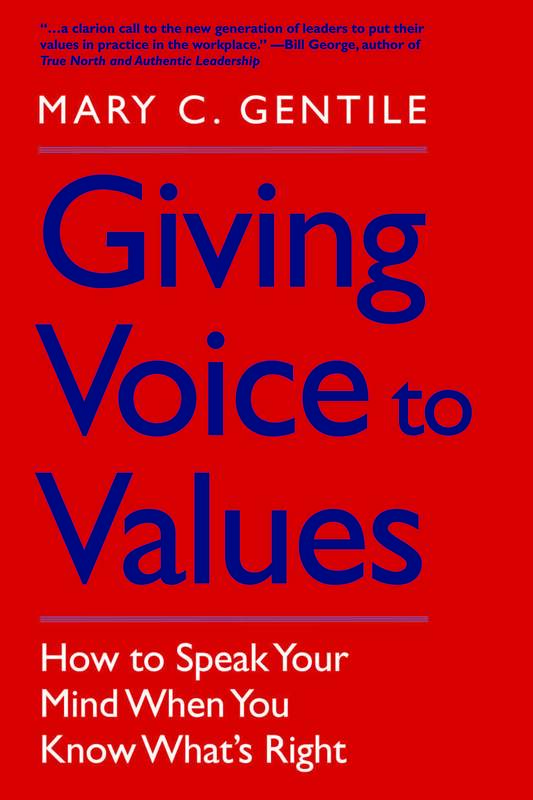 In an insightful solution-oriented new book, Giving Voice to Values: Speaking Your Mind When You Know What’s Right, she argues that most people do indeed want to do the right thing. The unfortunate reality is that, in almost any workplace in history, advocating for a particular strategy or course of action based on principle has always been a challenge. An argument for “doing the right thing” can seem high-handed, judgmental, holier-than-thou and out-of-touch with the profit-making imperatives of business – even when doing the right thing might actually improve long-term profitability, boost employee morale and minimize legal and financial risk. The solution, she suggests, is helping workers at all levels, from clerk to CEO, learn how to anticipate and counter predictable patterns of misbehavior. She likens the process to an individual learning a new physical skill or a sport. The more one performs practices drills, the more instinctive the response when the game is really being played. Expressing values openly and frequently, Gentile says, builds muscle for when it’s really needed in the marketplace. “If enough of us felt empowered – and were skillful and practiced enough – to voice and act on our values effectively on those occasions when our best selves were in the driver’s seat, business would be a different place,” she writes. Giving Voice to Values incorporates personal and organizational dynamics to help business people develop an “action” plan to deal with commonly heard “reasons and rationalizations” for questionable practices. Introducing new information and data into an argument might be one tactic. Another would be recruiting allies on behalf of your argument. Gentile recommends actually developing and practicing “scripts” to deal with anticipated issues. In fact, Giving Voice to Values has been developed into a broad problem-solving educational curriculum. Launched at the Aspen Institute with founding partner Yale School of Management, the approach has already been piloted at over 100 institutions worldwide, including leading schools such as MIT, INSEAD, Columbia and Harvard Business School. The ultimate goal is to make voicing values “a habit, a default position.” Given the human condition, that’s no simple task. Giving Voice to Values provides valuable straight talk and straightforward processes that can open up the corporate decision-making dynamic to new possibilities. It’s a challenge, really, for management and workers at all levels – to prove that speaking up for values does indeed make for better business. PreviousWhy Genetically Modified Foods Are Not Labeled in U.S.